Group photo of attendees at the 2018 BHL Annual Meeting. Photo taken in front of the Los Angeles County Museum of Natural History. Photo credit: Edgar Chamorro. 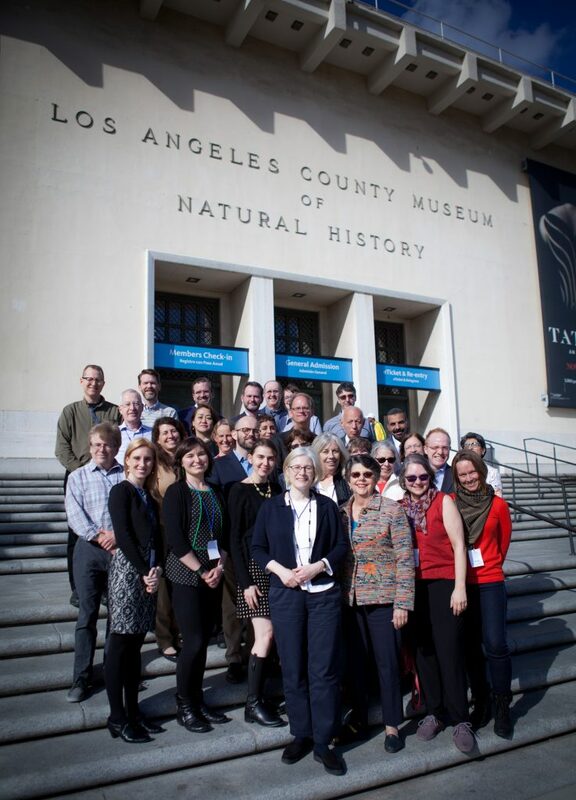 The 2018 BHL Annual Meeting was held in Los Angeles at the Natural History Museum of Los Angeles County and Los Angeles County Arboretum and Botanic Garden. The meeting was attended by 35 representatives of BHL partners from 11 countries. Four guest speakers discussed how biodiversity literature is relevant to their work : Dr. Austin Hendy, Collections Manager, Invertebrate Paleontology, NHMLAC; Dr. Jody Martin, Associate VP of Research and Collections and Curator of Crustacea, NHMLAC (Marine Invertebrate Larvae and the BHL); Dr. Gary Wallace, Research Associate at Rancho Santa Ana Botanic Garden and Botanist, Retired, United States Fish and Wildlife Service (BHL at LACM); and Dr. Victoria Vesna, Professor, Dept. of Design, Media Arts, UCLA and Founder and Director of the Art | Sci Center + Lab, CNSI, and Visiting Professor, Empowerment Informatics Program, University of Tsukuba, Japan. 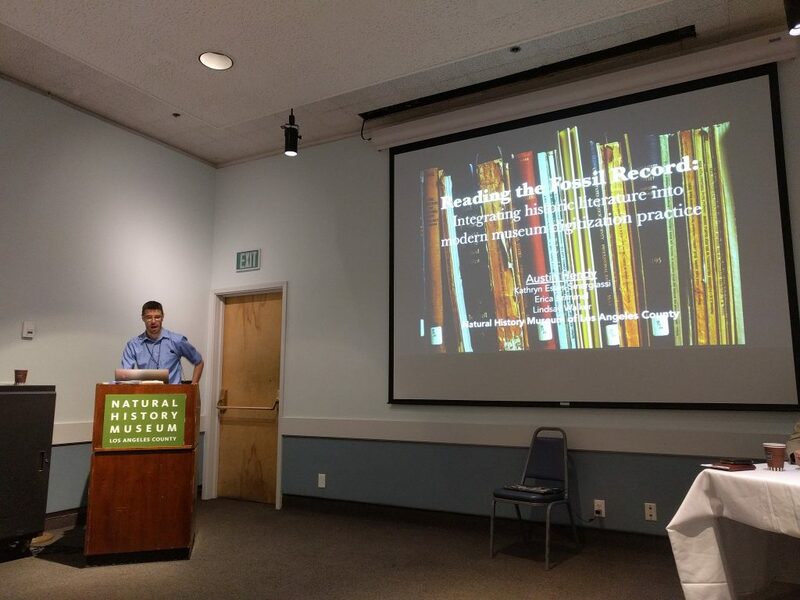 Dr. Austin Hendy, Collections Manager, Invertebrate Paleontology, NHMLAC, presenting during the BHL Users Symposium at the 2018 BHL Annual Meeting. Photo credit: Martin R. Kalfatovic. At an evening reception hosted by the Natural History Museum of Los Angeles County, BHL Outreach and Communication Manager Grace Costantino was joined by two Postdoctoral Fellows at the Rancho La Brea Tar Pits, Dr. Alexis Mychajiliw and Dr. Libby Ellwood, as the featured speakers. The topic of the evening talks was BHL and our users; Grace gave examples from conversations with our users (Empowering Global Research) and Drs. Ellwood (Passenger Pigeons in the Western United State) and Mychajiliw (Eyewitness to Extinction) spoke of their use of BHL in their work. In the business portion of the meeting, BHL Chair Constance Rinaldo gave an inspiring look to the future of BHL based on her ongoing discussions with the science community and BHL members and staff (BHL 2018: Looking to the Future). The BHL Secretariat provided updates on their work. 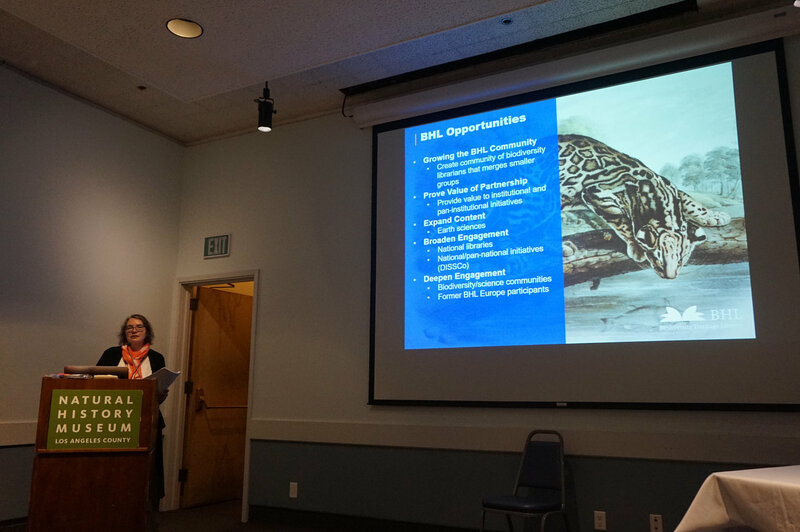 Bianca Crowley (BHL Collections Manager) talked about the growth of the BHL collections and Grace Costantino (BHL Outreach and Communication Manager) gave an update on outreach activities. BHL Chair Constance Rinaldo presenting on “BHL 2018: Looking to the Future” at the 2018 BHL Annual Meeting. Photo credit: Martin R. Kalfatovic. BHL Program Director Martin R. Kalfatovic and Program Manager Carolyn A. Sheffield gave updates on the work of the past year and the financial health of the BHL. The BHL Program Director’s Secretariat & Technical Update is available online. A new feature added to this year’s meeting was the Consortium Introspective: A BHL Symposium. BHL Chair Constance Rinaldo facilitated talks by Kelli Trei, Biosciences Librarian & Assistant Professor, University of Illinois (What Scientists Value about the Biodiversity Heritage Library: A BHL Blog Analysis); Susan Fraser, Thomas J. Hubbard Vice President and Director, LuEstherT. Mertz Library, The New York Botanical Garden (BHL — A Bright Constellation in the Biodiversity Universe); Mrs Wai Yin Pryke, Director of the National Library Singapore (BHL Singapore: Stories Our Collections Tell); and Mónica Aguilar Rocha, Digital Library Coordinator BHL México (Integrating digital content: issues and challenges to face in BHL México). 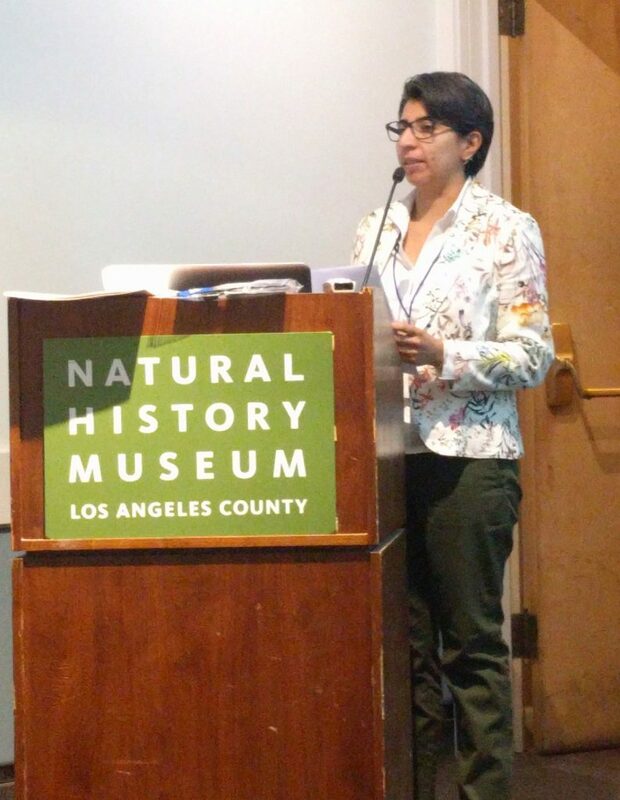 Mónica Aguilar Rocha, Digital Library Coordinator BHL México, presenting during the Consortium Introspective: A BHL Symposium at the 2018 BHL Annual Meeting. Photo credit: Martin R. Kalfatovic. Attendees at the meeting had the opportunity to participate in some wonderful tours. The first was to the La Brea Tar Pits and Museum. 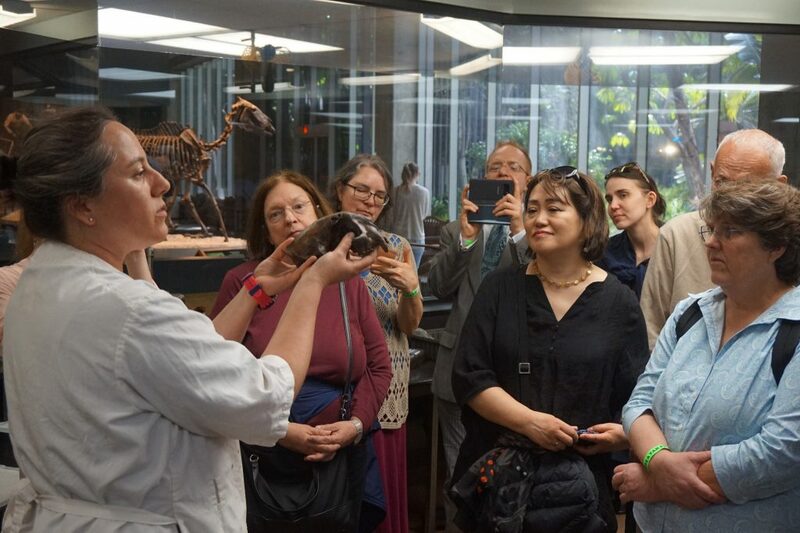 The tour of the La Brea Tar Pits had two components – an overview and visit to the active fossil excavation sites in Hancock Park as well as a “behind the scenes” tour of work that goes on in the Fossil Laboratory. Among the items seen in the Fossil Laboratory were macrofossil (bones of dire wolves, sabre-tooth cats, etc.) preparation techniques, conservation and restoration work, and the large scale microfossil sorting project. Stephany Potze (Fossil Lab Manager) showing off macrofossils during a tour of the Fossil Lab at the La Brea Tar Pits. Photo credit: Martin R. Kalfatovic. Susan Eubank facilitated a visit to the world-renowned Huntington Library, Art Collections and Botanical Gardens, where a tour of the Library as well as the Botanical Gardens was provided. The library and garden professionals highlighted their conservation and digital imaging labs along with the botanical and garden collections during a walking tour. 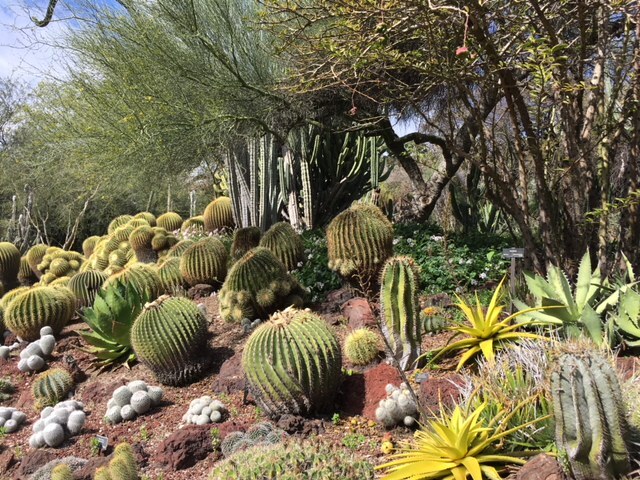 Photo of the Desert Garden at The Huntington Library, Art Collections, and Botanical Gardens, taken during tour of the Gardens. Photo credit: Constance Rinaldo. The culmination of the meeting was the selection of the host for the 2019 BHL Annual Meeting, and much excitement was generated as we waited for the voting results. The three contenders were the University of Toronto, Cornell University and the Smithsonian Tropical Research Institute in Panama. The Members voted to accept the bid of Cornell University. We look forward to gathering in Ithaca next year. The BHL community wishes to thank again our hosts, Richard Hulser (Natural History Museum of Los Angeles County) and Susan Eubank (Los Angeles County Arboretum and Botanic Garden). Martin R. Kalfatovic is the BHL Program Director and Associate Director of the Smithsonian Libraries’ Digital Services Division, responsible for the Libraries’ active Digital Library program. This program includes the creation of digital editions of library materials, online exhibitions, and new digital publications. Mr. Kalfatovic also serves as the coordinator for the Libraries’ participation in the Biodiversity Heritage Library, working with an international consortium of natural history and botanical libraries in the digitization of taxonomic literature.